When the combination of bling and swimming is combined, every little girl is prepared for a day in paradise. With the arrival of summer comes the search for those perfect swimming goggles to fit your little girl. Bling2o is the stylish solution for any girl to have a swimmingly fun summer! The Founders decided to make the creation as a fun project to do with their daughters. After many requests by friends to make a pair of sparkly goggles for their own daughters and pool parties the phenomenon was born. With a pair of twin sisters on the design team, who are seasoned in children’s merchandising and jewelry design, Bling2o goggles are always stylish. The Bling2o rhinestone goggles feature silicone straps, are anti-fog and tested for three-year-olds and up. 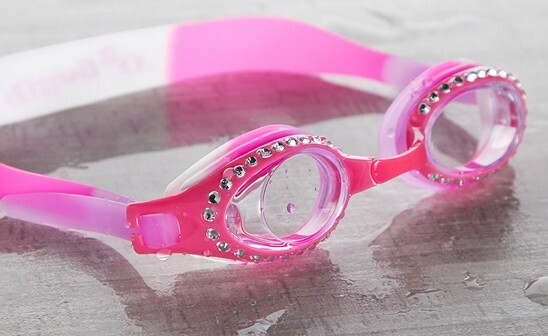 With summer here, any little girl will be the most stylish swimmer in the pool with Bling2o rhinestone goggles! When the combination of bling and swimming is combined, every little girl is prepared for a day in paradise. 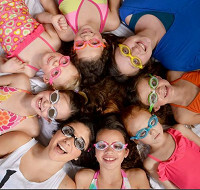 With the arrival of summer comes the search for those perfect swimming goggles to fit your little girl. Bling2o is the stylish solution for any girl to have a swimmingly fun summer! The Founders decided to make the creation as a fun project to do with their daughters. After many requests by friends to make a pair of sparkly goggles for their own daughters and pool parties the phenomenon was born. With a pair of twin sisters on the design team, who are seasoned in children’s merchandising and jewelry design, Bling2o goggles are always stylish. The Bling2o rhinestone goggles feature silicone straps, are anti-fog and tested for three-year-olds and up.